The starting line on Staten Island is closed to spectators, so grab your morning coffee at Paneantico Bakery at Mile 2 and get ready to cheer the runners into Brooklyn as they come off the Verrazano-Narrows Bridge onto Fort Hamilton Parkway in Bay Ridge. Start Times: Wheelchairs: 8:30 a.m.; Elite Women: 9:10 a.m.; Elite Men and the rest of the field: 9:40 a.m. Miles 3 through 13 wind their way through neighborhoods like Park Slope, Fort Greene, Williamsburg, and Greenpoint, so there are plenty of good places to stop while you cheer the marathoners to the halfway point. In Park Slope, grab breakfast or a Blue Sky Bakery muffin at Root Hill Cafe, around Mile 7. Or if you prefer booze for breakfast, Pacific Standard will be open early with $7 Marathon Marys on special. Leaders pass at: 9:43 a.m.-9:54 a.m.; non-elites at 10:10 a.m.-12:46 p.m. In Fort Greene, Lafayette Avenue transforms into a sidewalk festival with music, food, and lots of fellow revelers. Stop for a snack of a rosemary-aïoli-dressed BLT or a moist cheesecake brownie at Choice Market near the 8.5-mile mark. Leaders pass at: 9:54 a.m.-10 a.m.; non-elites at 10:20 a.m.-1:10 p.m. In Williamsburg, Marathon Sunday is basically a mile-long block party on Bedford Avenue. Blackbird Parlour, near the 11.5-mile mark, serves up breakfast, beer, and wine right on the course. Leaders pass at: 10:05 a.m.-10:15 a.m.; non-elites at 10:30 a.m.-1:45 p.m.
Greenpoint, around the 12-mile mark, is the runners’ last hurrah in Brooklyn. If you’re still hungry, stop for brunch and a pint at the atmospheric Manhattan Inn. Leaders pass at: 10:15 a.m.-10:20 a.m.; non-elites at 10:40 a.m.-2:05 p.m. 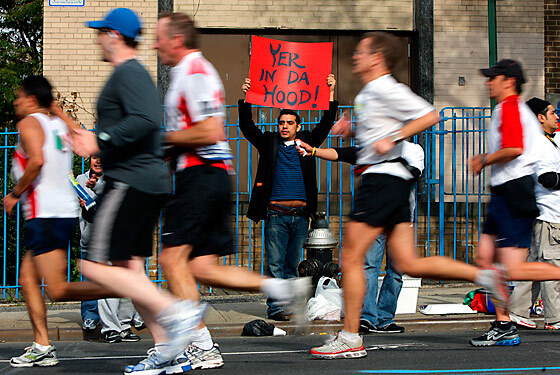 The runners have just passed the halfway point (13.1 miles) here in Long Island City, so this is a great spot to give them a little extra encouragement while you gear up for your second cheering wind. Have a seat at: Sweetleaf for a pick-me-up hot beverage or Lounge 47 for a cold one. Leaders pass at:10:22 a.m.-10:32 a.m.; non-elites at 10:45 a.m.-2:31 p.m.
Marathoners say that the 16- to 18-mile mark is where they really start feeling the burn, so now they need your rah-rah energy more than ever. Ramp it up with a bar crawl along the race course up First Avenue, where we suggest hitting O’Flanagan’s, Stir, Bar Coastal, Bistro61, and Bar East. Leaders pass at: 10:35 a.m.-10:50 a.m.; non-elites at 11 a.m.-3:30 p.m. If you make it up to the 20-mile mark in the Bronx, you won’t regret it. The one-mile section of the race that goes into the upper borough is packed with partiers who know how to make marathon watching a wild and crazy time. Bust out the cowbell at: Bruckner Bar & Grill, offering up $3 Bloody Marys. Leaders pass at: 11 a.m.; non-elites at 11:20 a.m.-3:45 p.m. Most UWS bars will be crowded with amped-up fans, but a few of them reward your rooting with drink deals or live music. The Central Park Track Club hosts its after-party at the Parlour, and Jake’s Dilemma should be another highly festive scene. Leaders finish at: 11:34 a.m.; non-elites at 11:51 a.m.-5:20 p.m. The author of Born to Run and chief proponent of the barefoot running craze speaks with elite coach Eric Orton and other masters of distance running (and special guests!) at New York’s Society for Ethical Culture (2 W. 64th St.); Nov. 5, 6 p.m.; tickets, $10 at the door and online. 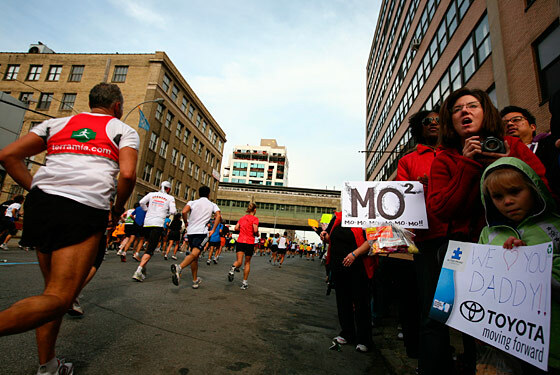 Rosie O’Grady’s is just a few blocks away from marathon headquarters, so it’s a popular hangout for elite athletes and their coaches and agents the week before the marathon (147 W. 46th St., 212-582-2975). For the full race-day schedule, click here.